If you need cheap storage array IOPS and lots of them, Fujitsu's DX600 S3 array can deliver those goods – at least according to an SPC-1 benchmark. 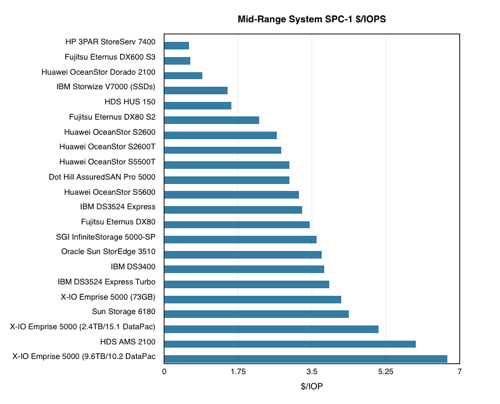 The Storage Performance Council (SPC) is an industry group dedicated to producing objective and vendor-neutral benchmarks to enable meaningful performance comparisons to be made between arrays. Its SPC-1 test simulates business-critical applications processing many complex transactions. According to the tests, Fujitsu's ETERNUS DX600 S3 array trounced mid-range array competition in the sheer IOPS stakes, recording 320,206.35, and coming second to a 3PAR 7400 with its $1.54/IOPS cost - based on list pricing. The HP number was $0.58, though the difference might well be lost once street and/or bid pricing gets to work. What this chart doesn't show is that the average response time of the DX600 S3 at 100 per cent load was 0.61 millisecs. The 3PAR 7400's equivalent number was 0.86 – the DX600 S3 is fast. Interestingly, although the DX600 S3 came eleventh in the overall SPC-1 rankings, it was number 1 in average response time at the 100 per cent load level – being the fastest-ever responding box in the SPC-1 lists we maintain. 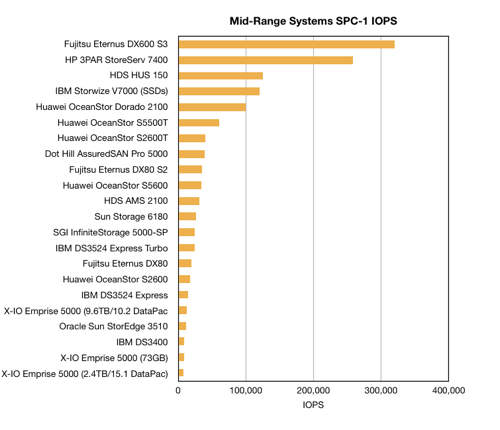 The "net net" of the result is that all-flash systems fly on SPC-1 benchmark runs and disk-based systems haven't a prayer of competing in the IOPS and $/IOPS comparisons.